Welcome to my monthly series where I share my blog stats and income with you. I was inspired to do this because I know of some bigger bloggers (like Pinch of Yum) who share their blog stats and income but I really didn’t see any smaller bloggers (like me! and maybe you!) who do so. I figured if I was looking for something like this, others might be as well, so I decided that I’d start sharing my monthly stats and income. 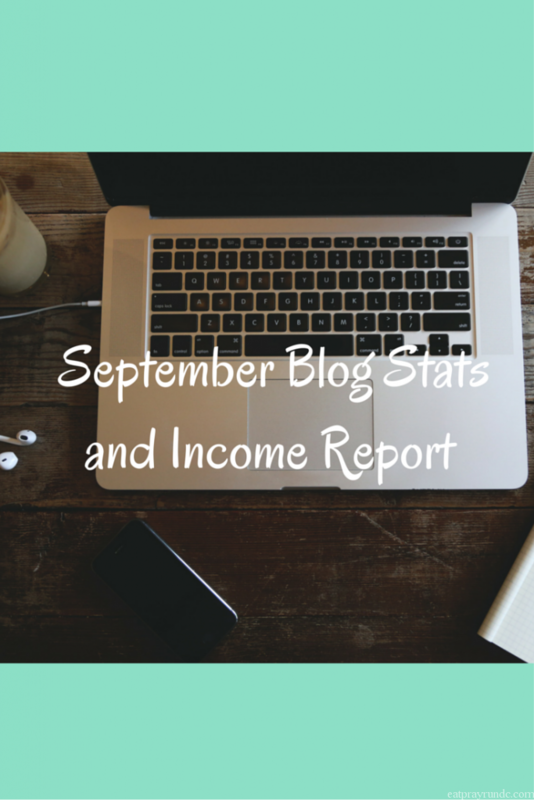 Here’s my September blog stats and income report – I hope you find this helpful (you can find August’s report here)! September was up a bit in page views and I already know that October will be up from September in terms of both numbers and income. As people come back from summer vacations, my numbers typically rise. Plus, as the temps drop, my most popular post on Pinterest (giving some tips for cold weather running) starts to get traffic again, and with over 20k pins, some of that traffic comes back to the blog. I’d like to continue to see an increase in numbers through the rest of the year. My fall into fitness giveaway. Five stages of the long run. In August, my top three referral source for traffic were: 1) direct sources – meaning that folks typed in Eat Pray Run DC directly; 2) google searches and 3) Pinterest. This past month, my top three referral sources were: 1) direct sources; 2) Pinterest and 3) google searches. I attribute this to my cold weather running pin regaining traction as the temperatures have dropped. As I’ve been mentioning over the past couple months, I have given myself a deadline of the end of the year to get a couple of things in place on the blog and I’m excited about them. I know I keep referencing exciting things, but they are really coming. I’m going to keep doing my blog stats and income reports on the blog because of the awesome feedback I received from y’all. However, I will be posting fewer blog tips on this blog. You will still see occasional blog tips as well as this mostly post, but starting sometime in early 2016, I’ll be moving most of my blog tips to a subscription list that will also contain some other fun things (i.e. it will not be an email just listing my blog posts – that’s what Bloglovin is for!). Are your blog numbers rising as the temperatures drop? My numbers tend to go up in the fall too. I’m looking forward to the new things on your blog! Looking forward to what you’ve got up your sleeve! I’m definitely seeing a little more traffic now that fall is here! Yay!!! Love that most of us are seeing an increase! So i haven’t really been tracking to be honest, but I did notice a drop off over the summer! Out of curiosity, how many views a month did you have before applying to Blogher? I actually found you by going to that post on Pinterest about running in the winter! I will admit I follow you on instagram but I don’t come to the blog often. Maybe if you plug your blog on Instagram when you post something new it would remind me to visit (and others too)! That is what got me here tonight!